Looks like what I pull loads of creeping from under next door's fence every summer; Campanula Glomerata, can be invasive! Think its the one with russian sounding name poshknickers ? No cant spell or pronounce it Russian name like poshknicers - campanula pushkin - something small blue star shaped flowers.Poppy isnt glomerata more upright with darker flowers . There is a russian species C.Punctata which is low growing & spreading. It would be quite a nice plant (i have some campanulas in my borders which look great each summer) if it wasn't for the low growing habit; it just looks like a weed unfortunately. Intrigued by this poshknickers thing I looked out a book to see what it could be C.poschkarskyana is a safe bet Bonkers. 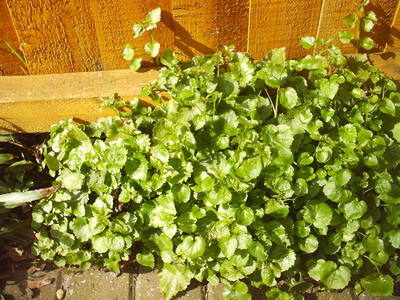 The leaves dont look quite the same as the one we both have creeping under fences but, anyway it says that one is invasive too at least you know what you will be dealing with; just keeping pulling loads up each year, it'll keep coming back! It's not Campanula glomerata, the leaves are wrong. It could well be C. portenschlagiana - they are both invasive and lovely! After all, you can always dig some up or split them if they get in the way! C. port-etc is the one you see dangling over walls in the summer. There are others very similar. too - need to see the flowers to be sure of an ID. I've found lots of low growing spreading species now they are all much of a muchness, I wouldn't split it & put it elsewhere, before long you will find it smothering your other plants. As I said I have been battling against it's invasion for years; it really is weed-like. Thank you Poppy think you owe me apology Chezs now dont those names sound like poshknickers . I do bonkers things but try not to give bonkers advice as would hate to think my affliction contagious.